SENSATIONAL - The experience starts in an elevator which bring you at the top of a Manhattan building. On the roof, you will have to fight your fears and walk on a beam at 300 meters high! Be prepared! SPORT - Get started in the jungle at maximum speed in this fun and addictive reflex game! Jump, bend over, dodge and catch the coins at the same time! Adrenaline guaranteed! EXPERIENCE - "Quand je suis parti..." is a virtual reality experience to live and understand the Syrian exil. Live the story of Eyad, a young Syrian refugee who fled a war torn country to offer a better life to his family. ARCADE - Blasters of the Universe is an action/arcade game. Select your weapon, weapon equipments and shield to battle versus hordes of ennemies attacking you without interruption. Dodge the bullets, destroy your opponents. ESCAPE GAME - VR: Vacate the Room is a short Escape the Room game inspired by such classics as Crimson Room. It is a VR Experience where you need to find clues to solve puzzles and find your way out. ARCADE - Join the pitstop et be ready to equip the incoming Formule 1! The timer just started so you will have to be quicker than your competitors! ESCAPE GAME - A Lost Room is a Virtual Reality escape game. You're trapped in a apparently normal room, where you must find items and solve puzzles to escape. Skilled escapers only. ACTION - VR2017 is a cooperative game about surviving, alone or in multiplayer (up to 4), in an isolated place zombies are attacking without end! Buy weapons and hold as long as possible using all the ressources available around you. MUSIC - Drummer Talent VR is a drumming simulation VR music game. Players use their VR controllers to play on a full virtual drum kit. choose your favorite stage from various different locations and decide which tracks to play. Learn in Easy, start the show on Hard. Start a new realistic experience at 400km from Earth in the International Space Station (ISS). Equip and experiment a mission in space but be careful, the survivability of the crew depends on its success (this experience must be played seated). ARCADE - inVokeR is a one versus one wizard dueling game for VR platforms. Two players (possible to play versus CPU) fight each others with projectiles and spells to change the fate of the battle. By Xiamen Leiting Interactive Network Co.,Ltd. ACTION - Deadly Hunter is an immersive first-person defense game designed exclusively for VR. You play as a renowned Orc hunter whose goal is to learn the enemy’s weaknesses and use the best-suited traps to protect your own! ESCAPE GAME - Search for secrets and hidden evidence of humanity’s broken past in this tensely immersive VR puzzle mystery game. Navigate your way through houses, prisons, and through time piecing together clues of who released the Nano Virus that still ravages the surface to this day. COOPERATION - MonsterPlants vs Bowling, an asymmetric cooperative game for 2 players! Defend your backyard with your teammate thanks to the projectiles at your disposal: bowling balls! ADVENTURE - Become a powerful Wizard and take fate into your own hands! Immerse yourself in a beautiful fantasy world and use motion controllers to destroy your enemies by weaving elemental magic! CONTEMPLATION - Frontier VR is a game about observing and interacting with small things around. The game is available with a weaponless mode for children. The game is a short experience ideal for people discovering virtual reality. EXPLORATION - Echo Grotto is a virtual reality experience that lets you explore unique and intricate cave systems using a range of caving gear and tools! ACTION - VRZ: Torment is a survival horror game for one or up to 6 players. Take a weapon and explore a dangerous island or try to survive as long as possible to have your name on the leaderboard. PUZZLE - HURL VR is a skill and puzzle game at the same time. Play in a unique futurist 3D world to reach the target using platforms, bumpers and teleporters. Use helps if necessary. ARCADE - Spartaga starfighters battle through a VR Bullet-Hell! Fight and survive in dozens of levels for a few minutes run or during multiple hours. Jump into a classic genre re-imagined for Virtual Reality. DRAWING - MasterpieceVR is a simple and intuitive software to draw and sculpt in 3D! Alone or with other people in the same space (2 players). Coloring for children or creation of an object/character from scratch for parents. Organize drawing games and contest for families, groups and team-buildings. 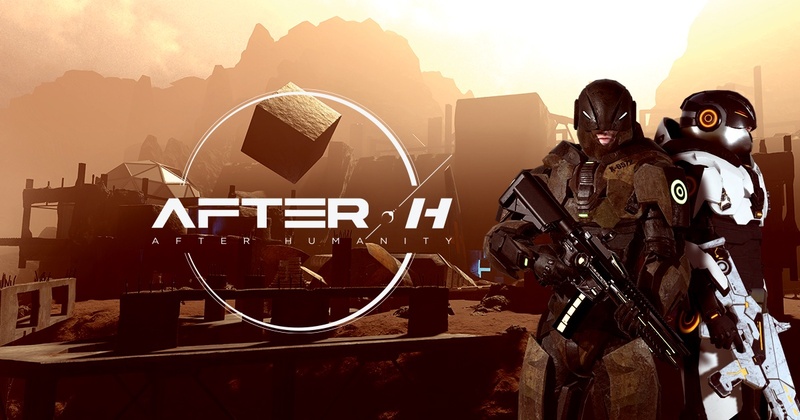 With an FPS gameplay, AFTER-H opposes teams in full immersion, from 2 to 8 players equipped with VR headsets and connected guns. Sent on Mars, they fight to take control of the solar system resources... A collaborative, competitive and sensational experience! ARCADE - Save the spirits of the forest before it is too late! In a Japanese enchanted forest, the Kodamas are in danger. Protect them in your lantern and bring them back to the Spirit Tree to save them! WARNING - French version. Start a new realistic experience at 400km from Earth in the International Space Station (ISS). Equip and experiment a mission in space but be careful, the survivability of the crew depends on its success (this experience must be played seated). COOPERATION - After-H: Mission 1 is a free roaming experience in a 10x10 meters area where a group of players, from 4 to 6, has to investigate a research team not responding in a colony fort on Mars. Fight for your life, survive as a team ! 25 minutes scenario. ARCADE - Beat Blocks VR is a VR Arcade Puzzle game where your goal is to assemblate blocks and make best combinations to be the best player in the world. Very innovative game, you will interact directly with shapes linked to the level soundtrack. ESCAPE GAME - Dr. Perkins has been killed in his own lab. Look around, investigate, analyse everything and find the the murder weapon, the killer and his mobile among the nine possible scenarios ! COOPERATION - Another dimension exists and Incarna is actively seeking explorers of a new kind, ready to accept the unthinkable. You have answered our call and you are about to be tested at one of our assessment centers. No game found. Consider changing the filters. AND WE ADD NEW GAMES WEEKLY!